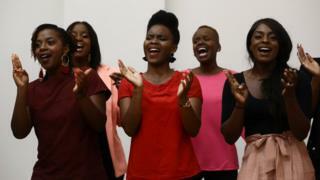 The gospel choir who performed at the wedding of Prince Harry and Meghan Markle have signed a major record deal with Sony Music UK.The Kingdom Choir performed Stand By Me in front of an estimated global TV audience of 1.9 billion people at the royal wedding on 19 May.Prior to that, their biggest show had attracted about 200 people.Their performance later topped the US gospel chart, while the YouTube video has been watched three million times. The London-based choir, which features 30 singers, was formed in 1994 by award-winning conductor Karen Gibson, who had previously sung backing vocals for The Beautiful South. In 2000, they won BBC Radio 2's Minstrels in the Gallery, a competitive festival of religious music. Two years later, they were nominated for best UK Choir at the Oasis Awards.They have since performed alongside Sir Elton John, Luther Vandross, the Spice Girls and Michael Ball. The group will go into the studio later this month to begin work on their debut album, which is set for release on 2 November and will include their arrangement of the Ben E King classic. In a statement announcing the release, Gibson said: "The Kingdom Choir are absolutely delighted with the journey of the past few months. "It's been a rollercoaster, but we wouldn't have it any other way - first, the honour of being able to sing at the royal wedding, and then the thrill of being signed to Sony." Sony Music boss Nicola Tuer said she had "jumped at the chance" to sign the group. "The choir believe in love, music and power and we are excited to capture this on record for their fans across the globe." » Who will change first - Meghan or the Royal Family?